Without rules--without order--all the matter and energy in the universe would be useless. It would be one big mess. Similarly, highsec would be nothing more than a garbage pit without the Code. But with the Code, highsec becomes a world. That's a place you can live in! 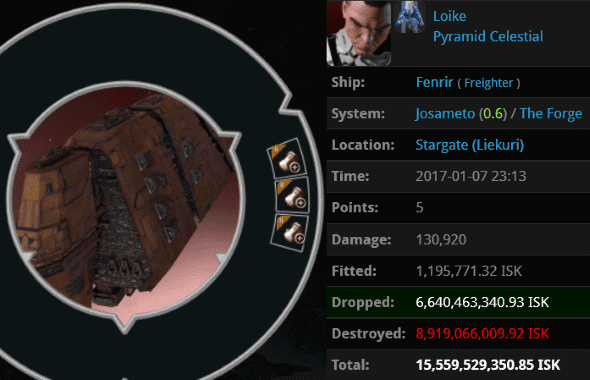 You can see, then, that our Agents weren't wrong to destroy the following ships during the week of January 1st @ 00:00 EVEtime through January 7th @ 23:59 EVEtime. We used to get one of these every other week. 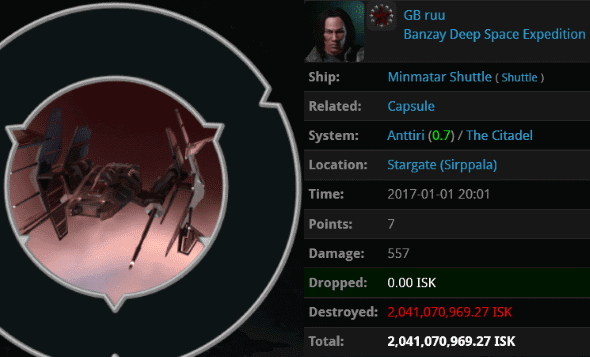 GB ruu went AFK and set his shuttle to autopilot, losing 2 billion isk in the process. Though expensive shuttles haven't been nearly as common lately, Agent Salah ad-Din al-Jawahiri hadn't let his guard down. Yes, it was the classic "two PLEX in a shuttle" gambit. Incredibly, later this week, another shuttle with two PLEX was killed by Agent Tisiphone Dira. I guess the carebears are back up to their old tricks. aries lol lived up to his name when he assembled his Retriever. With a tank consisting of two Civilian Armor Repairers, he stood little chance against Agent Alexander Kirenski. No rigs? No midslot? No problem! ...Yeah. Strangely, aries lol had another Strip Miner in his cargo, but he chose to keep an Ice Harvester equipped just in case some ice popped up in the asteroid belt he was mining. 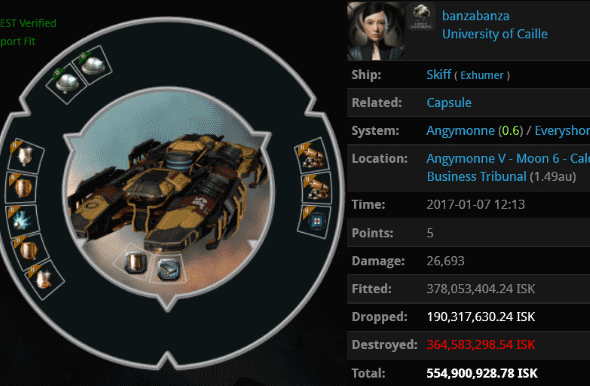 It was a pretty bad week to be a non-compliant hauler. 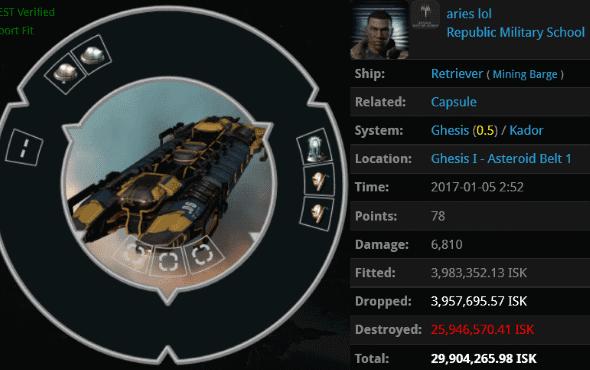 Loike collected 15.5 billion isk of his wealth and put it into a triple-expanded freighter. Off to Jita it went! It didn't reach its destination--something about a missing permit. Agents SynthiaGreey, Bratok Srayona, Perlo Tissant, Unfit ForDoody, Jack Fizzleblade, Ido Adudu, Logical Fallacy, Elite Highsec PvP, Darnoth, Liz Cadelanne, Git Guud Nurd, Sinister Minister, Jet Set Milly, Bint Bint, Skiff Poddington, Hawken Askiras, BAE B BLUE, Mack Poddington, Sorg-frae, Mark Ormerant, Urban Worrier, Lawrence Lawton, Archibald Fizzleblade, Morrigan Laima, James Poddington, Oryae Veris, Hulk Poddington, and Anenomie Inside hit the reset button on Loike and all his possessions. Better luck next time. 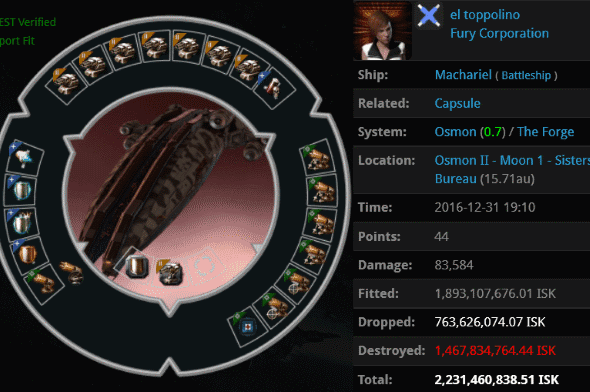 Late last week, el toppolino hopped aboard a faction battleship packed with weapons and expensive defensive modules. Through the magic of the Code, she somehow ended up engaged in combat with Agents Ullus Demos, 007 JBond, and Krig Povelli, who were all flying Caldari frigates. "Shoot something that can shoot back!" the rebels demand. el toppolino wishes they hadn't. A fleet of miner gankers went forth into the Gallente regions of New Order space. They were searching for non-compliant vessels. Our heroes found banzabanza mining away in a heavily tanked Skiff. They could tell she was arrogant just by looking at her ship--which had a pair of ORE Ice Harvesters. Agents reaper Shardani, karma balancer, Zane Arnolles, Lichelle Marie, Jaxi Wreckful, Mildron Klinker, Lillie Naari, Jeni Savage, and Jana Grebb taught the miner some humility. Yet another autopiloting shuttle! Stard Derko's Leopard bit the dust when Agent Aaaarrgg caught it with his trusty Thrasher. Then he cracked open the pod. 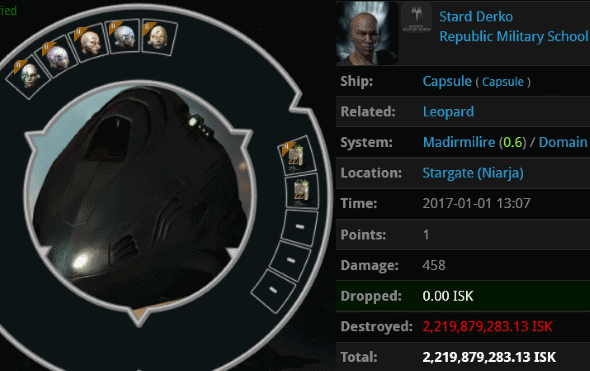 Stard Derko had a 2.2 billion isk set of implants designed to improve his agility. His Leopard shuttle must've had a very impressive align time. But then, as all autopiloters must do, it dropped out of warp and slow-boated to the next stargate. All it could do was die. Such is a ship without the Code. El Toppolino - toppled. Good job. I like Machariels. Not this one though. Blinging a Mach is somehow especially revolting. Keep it simple, folks, keep it straight. Its funny when you see " mackinaws and retrievers dock up " from a skiff pilot and he is the one to explode. Mmmmmmmmmm Ritalin Today Ritalin Tomorrow. So much Ritalin on these past few weeks posts. Remember Ritalin is easy. A very minor post this week, for kills of the week. Seems there a few old names showing, in a limited capacity, and the rest amateurs. Whine when we gank and then whine when we don't gank enough to your satisfaction. Miner, calm down. If you want, I heard there is a hisec militia blog that no one reads. You could check that out. Ignorance seems to be a prevailing trait in ag, maybe the solution to the ag question is education. "Yes, it was the classic "two PLEX in a shuttle" gambit." change name from minerbumping to shitposting miner ganking other miners.